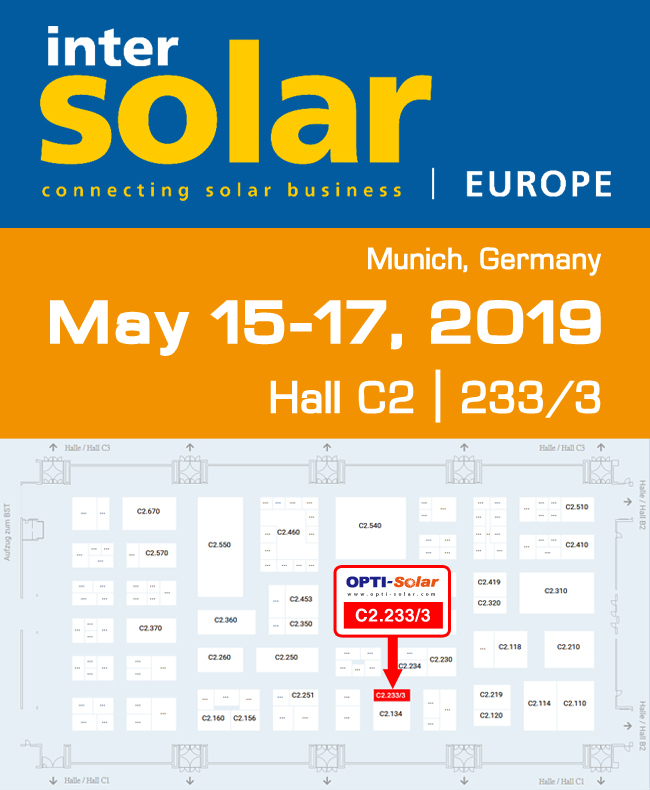 OPTI-Solar will participate from the 15th to the 17th of May in the Intersolar Europe 2019 exhibition in Munich (Germany), one of the leading events with the biggest repercussion in the solar industry. 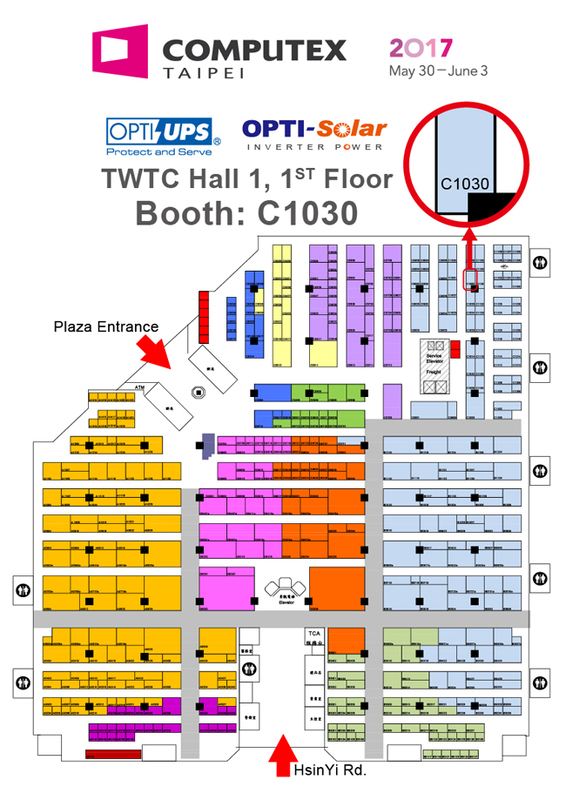 OPTI will release 10-200KVA high-performance UPS, and multi-power of solar inverters at Computex 2017. Participants can be able to personally feel the excellent performance of OPTI products, and understand the innovative and design can be to the best solution for various power required which can bring your need. OPTI has been committed to green energy solutions and power protection continuously. OPTI-Solar will participate from 30th May to 3th June, 2017 in the Computex 2017 exhibition in Taipei. We hope you to visit our booth at TWTC Hall 1, 1st Floor, Booth Stand C1030. We hope to learning more about your requirements and needs, and welcome you discuss about your way to offer your customers green, efficient and expandable system. and multi-power of solar inverters to the best solution for various power required. During the exhibition, participants will be able to personally feel the excellent performance of OPTI products, and understand the innovative and design under modern technologies which can bring your need. 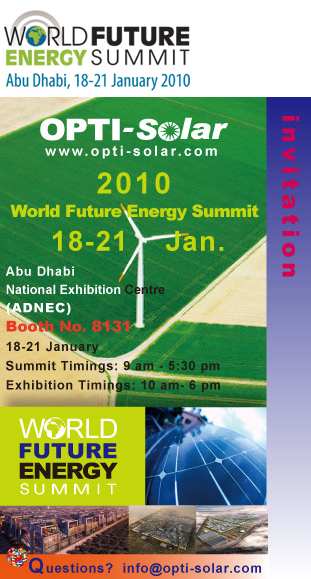 OPTI invite you sincerely to visit our booth at TWTC Hall 1, 1st Floor, Booth Stand B1321. OPTI-Solar will participate from 31th May to 4th June, 2016 in the Computex 2016 exhibition in Taipei. We hope you to visit our booth at TWTC Hall 1, 1st Floor, Booth Stand B1321. 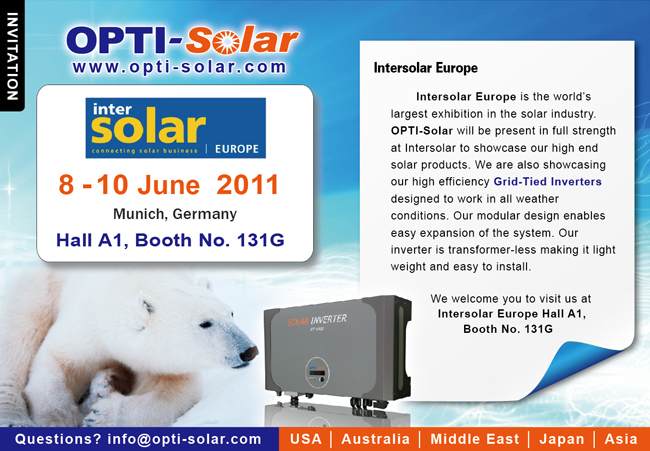 OPTI-Solar will participate from the 10th to the 12th of June in the Intersolar Europe 2015 exhibition in Munich (Germany), one of the leading events with the biggest repercussion in the solar industry. 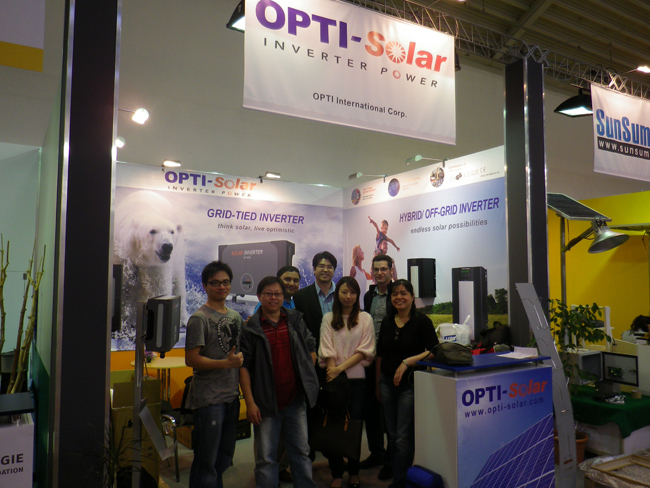 OPTI-Solar exclusive representative in Argentina, Energias Inteligentes, participated to the 2014 edition of Feria Nordelta. 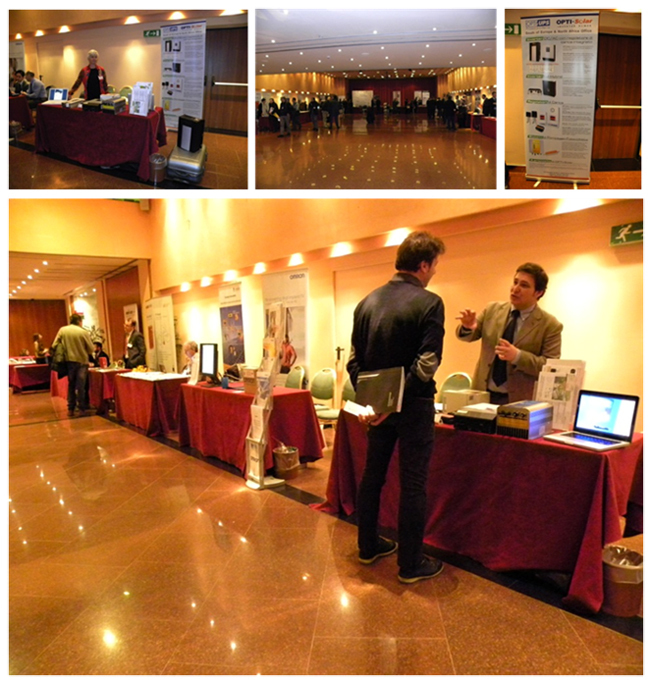 The solar exhibition took place on the 17-18 of May and it was a great success for business and professional networking. As for Energias Inteligentes, many visitors stopped by to know more about our complete systems composed of solar inverter, charge controller and solar panel. It was a good opportunity for us to present our brand and our solutions to more people in South America, a region that gathers ideal conditions for the utilization of solar energy. We are proud to support our partner, Energias Inteligentes, a very young and active company which is growing really fast. We share with them a vision and a mission to provide complete solutions in renewable energy systems in Argentina, Chile and Uruguay. In fact, they also joined the agriculture fair of Agroactiva 2014 on the 4-7 of June, in Cañada de Gomez, Santa Fe, the largest fair in the open world with more than 800 exhibitors and an area of 20 hectares. Energias Inteligentes presented as well our renewable energy systems and especially our hybrid solar installations that won great resounding during the fair. They displayed the hybrid installation through a running system that fed the stand, and managed to attract over 500 visitors interested in cutting edge technology. Many thanks for the people who took the time to visit our partner's booth at these exhibitions and if you didn't have the chance to meet them or if you have any inquiry, please do not hesitate to contact them in Argentina through http://www.energiasinteligentes.com. 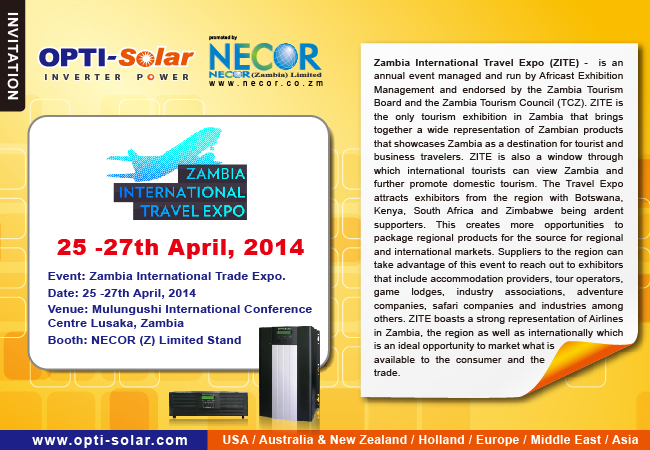 Event: Zambia International Trade Expo. The 2014 edition of INVEX, the only Italian B2B event dedicated to inverters, batteries, energy storage and charging stations, was this year again a great success for business and professional networking. In a context of growth in Europe for the inverter sector, about 500 qualified professionals attended the exhibition, from small independent installers to industry’s leading brands such as OPTI. During this year's event, the fourth of its kind, OPTI appeared as a strong, reliable and experienced actor with its 20 years on the international market. It was the opportunity to display once again the quality of the wide range of products and to present the new products, in line with the market changes. It was the chance as well for some European actors to realize that the “made in Taiwan” has nothing to do with other low quality short-term manufactured products, a confusion that is still too often present in some people’s mind. Many thanks for the people who took the time to visit our booth at the exhibition and if you didn’t have the chance to meet us or if you have any inquiry, please do not hesitate to contact our representative for Mediterranean Europe and North Africa at andrea@opti-solar.com. 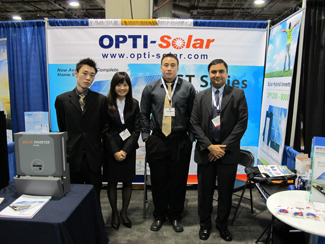 Date: June, 2011 Intersolar Europe a Success! It was great meeting everyone at Intersolar Europe! OPTI-Solar thanks all of you for your support this year and we hope we can continue to provide our great products and service in the future. We want nothing more than to offer the best for our customers, so please contact us at info@opti-solar.com with your requirements, and we believe we will have just the thing for you! We are looking forward to speaking with you! 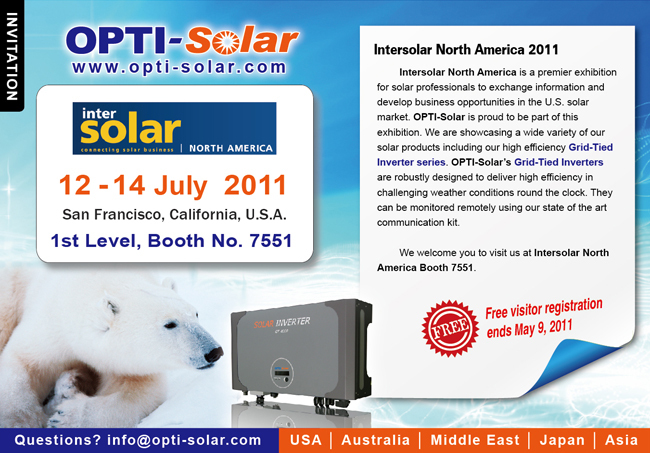 If you are stopping by Intersolar North America, please also remember to come visit us at our booth! 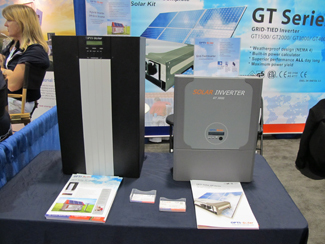 For more information, check out Intersolar North America's website. To register for Intersolar North America, please visit Intersolar's Visitor Registration. For more information, check out Intersolar Europe's website. 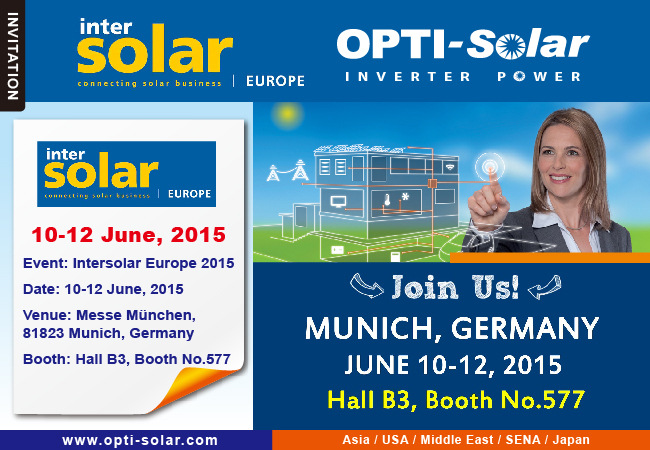 To register your ticket, please visit Intersolar's E-ticket Registration. For more information, check out CanSIA website. For more information, check out XXIII Feria Internacional El Salvador website. Visitors can Register Online here. Thank you for showing your support in Solar Power International in Los Angeles. 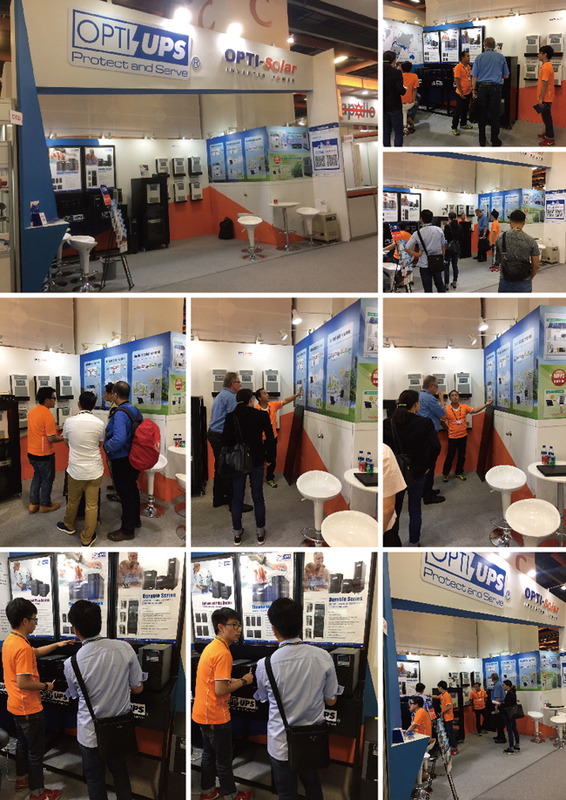 This is the first time OPTI-Solar has presented our quality solar inverters in SPI and it was a great experience to provide these great products for you. We are so happy to meet you there, and hope to give you more reliable solar solutions for years to come! For more information, check out SPI's website. 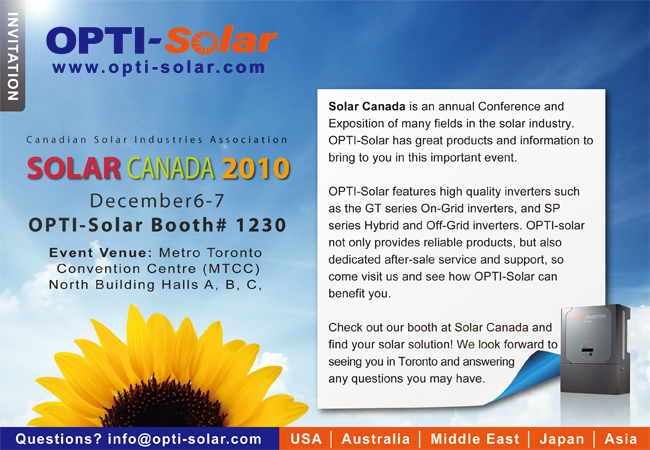 For more information, check out Intersolar website. 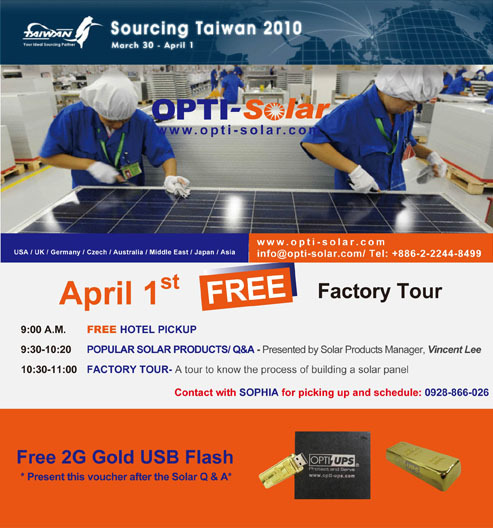 Thank you all for your participation and support last year at Sourcing Taiwan 2009. We invite you all to come join us again, or if you couldn't make it last year, please come visit us this year. We will provide you with our services and introduce our newest UPS and solar systems to assist in your everyday needs. 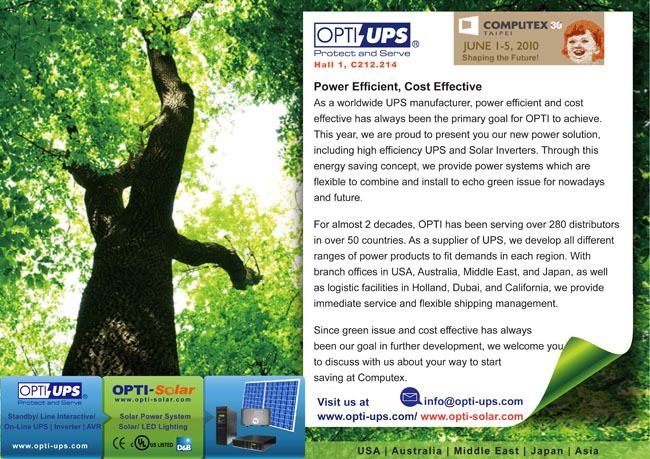 OPTI-UPS was established in 1991, and OPTI-Solar was established in 2006 by OPTI-UPS. 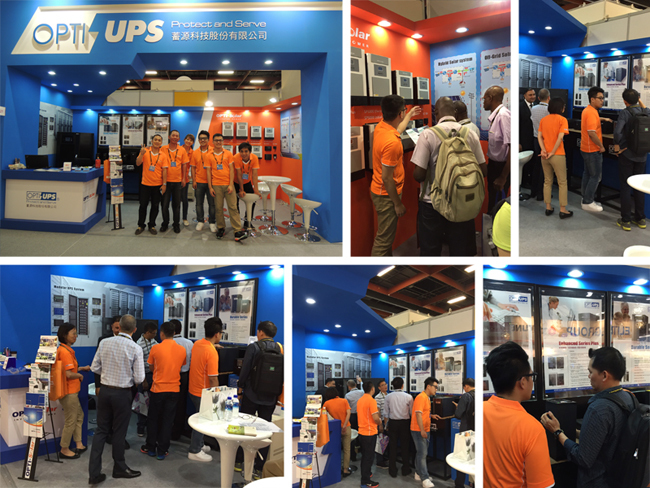 Being a supplier of Uninterruptible Power Supply (UPS), OPTI-UPS has focused on the export market since 1991. 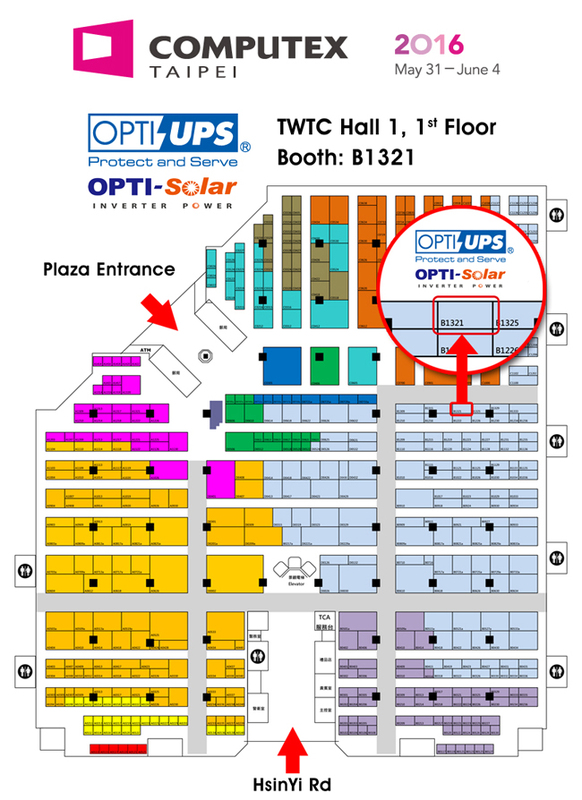 Up to now, OPTI International has distributors spread out all over the world, and with its expertise and knowledge in power protection, OPTI-Solar is created to provide solutions to people's daily solar needs. For service support, we provide thorough and prompt services in consultation, configuration, maintenance and repair. Moreover, we conduct regular product updates and technical seminars to benefit our partners. Our confidence in superior quality and more than 19 years of solid achievements have satisfied customers worldwide with continuous growth for all parties every year. In OPTI-UPS brand, we provide wide range loads of UPS for different devices in three main series, Standby series, Line Interactive series, and On Line series. In OPTI-Solar brand, we offer series of Solar Power System and Solar/LED Lighting products based on energy saving and cost-effective consideration, including solar panels, solar inverters, and solar lights of different scales. Please come visit us and let us help you find solutions to your everyday needs. Also please feel free to contact us with any questions at info@opti-ups.com.tw. In April 2006, Abu Dhabi took a bold and historic decision to embrace renewable and sustainable energy solutions. As the first major hydrocarbon-producing nation to take such a step, it established its leadership position by launching Masdar, a global cooperative platform dedicated to finding and deploying solutions to some of the mankind's most pressing issues: energy security, climate change and truly sustainable human development. The World Future Energy and Environment Summit and Exhibitions have created one of the world's must-attend events in future energy, an unmissable networking and business opportunity for the energy and environment communities. For more information, check out IGEM website. Be sure to Register Online to avoid queues on event!